Voters ﻿statewide ﻿will ﻿be ﻿asked ﻿to ﻿decide ﻿yes ﻿or ﻿no ﻿on ﻿six ﻿proposed ﻿amendments ﻿to ﻿the ﻿Louisiana ﻿Constitution ﻿on ﻿the ﻿Nov. ﻿6, ﻿2018, ﻿ballot. ﻿These ﻿amendments ﻿address ﻿a ﻿number ﻿of ﻿serious ﻿issues. 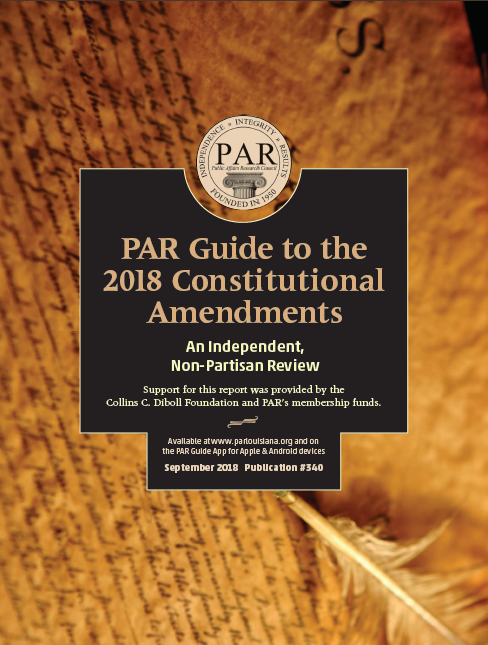 This ﻿PAR ﻿Guide ﻿to ﻿the ﻿2018 ﻿Constitutional ﻿Amendments ﻿provides ﻿a ﻿review ﻿of ﻿each ﻿proposed ﻿amendment ﻿in ﻿the ﻿order ﻿they ﻿will ﻿appear ﻿on ﻿the ﻿ballot, ﻿plus ﻿the ﻿fantasy ﻿sports ﻿item. ﻿The ﻿Guide ﻿is ﻿educational ﻿and ﻿does ﻿not ﻿recommend ﻿how ﻿to ﻿vote. ﻿It ﻿offers ﻿concise ﻿analysis ﻿and ﻿provides ﻿arguments ﻿of ﻿proponents ﻿and ﻿opponents. ﻿These ﻿proposals ﻿were ﻿passed ﻿during ﻿the ﻿regular ﻿legislative ﻿session ﻿earlier ﻿this ﻿year. ﻿Each ﻿bill ﻿received ﻿at ﻿least ﻿a ﻿two-thirds ﻿favorable ﻿vote ﻿in ﻿the ﻿House ﻿of ﻿Representatives ﻿and ﻿in ﻿the ﻿Senate ﻿and ﻿now ﻿needs ﻿a ﻿majority ﻿vote ﻿at ﻿the ﻿polls ﻿as ﻿required ﻿for ﻿passage ﻿of ﻿constitutional ﻿amendments. ﻿The ﻿governor ﻿cannot ﻿veto ﻿proposals ﻿for ﻿constitutional ﻿amendments. Voters must do their part. In order to develop informed opinions about the proposed amendments, they must evaluate each one carefully and make a decision based on its merits. The deadline to register to vote is October 16, 2018. For more information on registering to vote, visit the Secretary of State’s website. The Public Affairs Research Council of Louisiana (PAR) is an independent voice, offering solutions to public issues in Louisiana through accurate, objective research and focusing public attention on those solutions. PAR is a private, nonprofit research organization founded in 1950 and supported by membership contributions, foundation and corporate grants and special events.